Click here to stream In Your Absence. Forethought: in every endeavor, the potential for triumph is shadowed by the threat of devastation. Often, the realization of one's ambitions plays out in cruel harmony with the catastrophe wrought by their attainment. In this promethean drama, an actor feels the warmth of the fire's gift and the ache of the eagle's curse in chorus. Muted is the brilliance strived for, forever out of reach. 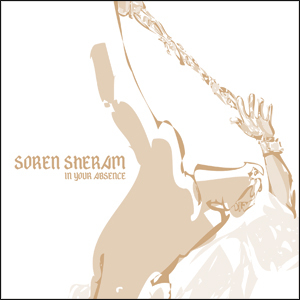 On In Your Absence, Soren Sheram's training as a pipe organist provides a foundation to be distorted, detuned, and ultimately denied in the yearning for an inversion of traditional themes. Ringing keys and wheezing reeds sheltered by processed murk give way to lyrical motifs, bridging abstraction and classicism through the undoing of their preconceived attributes. Compositions cycle through a continual progression of ruin and renewal, grasping for beauty yet lamenting its implausibility. Complexities fold over one another to create dense structures alternating between elation and mourning. For all their layers, what is absent reverberates most forcefully.